Mount Dennis might be the next neighbourhood to transform itself, but even if real estate here is no longer the cheapest in the city, there's still a waiting game to be played. Spending a day here is nothing like dawn to dusk in any of Toronto's more desirable districts. For one thing, you'll save a lot of money, and you'd better bring some decent walking shoes. It might take as long as a decade for the Eglinton Crosstown LRT to open its new transit hub here in the old Kodak lands, but the main drag on Weston Road is only gradually shaking itself out of its doldrums and decay. In the meantime, day-trippers to the area can stake their claim to seeing Mount Dennis "when it was still dodgy," and perhaps shop for more house than they'd find in Parkdale or Leslieville. Here's how to spend a day in Mount Dennis, from morning to as late as you feel safe. 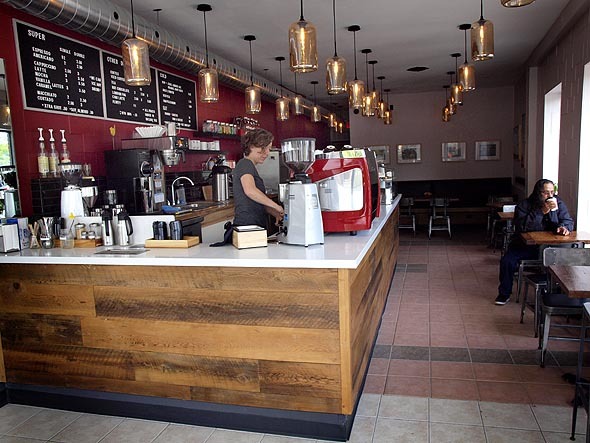 Until this spring, a day in Mount Dennis would have to begin in either the city's most depressing Coffee Time (now closed) on Weston Road north of Eglinton, or at the Tim Horton's in Jane Park Plaza, near the southwestern edge of the neighbourhood. Locals were amazed and grateful, though, when Cassandra Nicolaou opened Supercoffee on the corner where her father once ran a sub shop. There's not a lot to do indoors in Mount Dennis just yet, unless you want to kill some time shopping for high-end kitchen appliances at Caplan's, a longtime neighbourhood business that reinvented itself a generation ago to sell high BTU cooktops and stainless steel fridges to home renovators. Instead, I'm going to put you on a bus and send you ten minutes north to Weston, historically Mount Dennis' rich cousin, to take a leisurely morning stroll indulging in that most Toronto of pastimes - real estate voyeurism. Weston Road up here is almost as dire as it is at Eglinton, but the streets just to the east of the railway construction pushing the new Union-Pearson rail link through the neighbourhood are packed with gems, a whole shopping list of home types ranging from early Victorian to midcentury modern, built for the professionals and "rich farmers" who built the village of Weston. 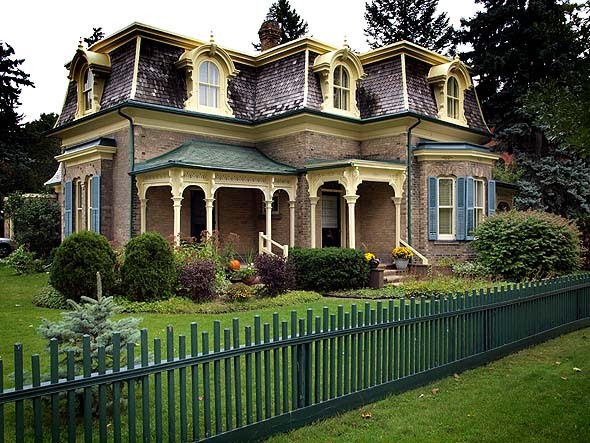 A few steps away from the construction crews and you'll feel like you're in some small town in southwestern Ontario as you marvel at the mostly unrenovated detached homes on their big, tree-filled lots. Toronto is a very big place, and if you ever wanted to know where people with Annex money will live when they can't find an Annex house, this would be the place. Tell your friends. 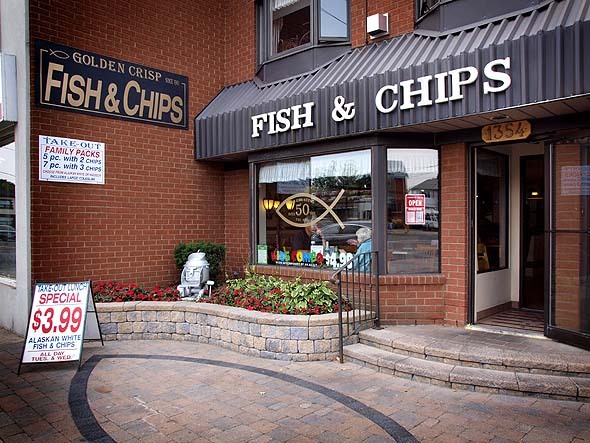 Get back on the Weston Road bus and head south to Golden Crisp Fish & Chips, in business here for over fifty years and regularly overlooked in lists of the city's best chippies. Owner Harry Vandekamp is friendly and garrulous and a booster for the neighbourhood where his family have been a fixture since Dief was chief. For something more exotic, walk down to where Eglinton crosses Weston for some Caribbean food at First Class Delites, a Restaurant Makeover survivor; try the red pea soup. Apart from food and drink - and depending if you want that Garland range at Caplan's - there's not a lot to tempt the money out of your wallet yet in Mount Dennis. Brave little businesses like MV Liquidations, a recently-opened thrift shop, soldier on among the storefront churches and hair shops on Weston, but be warned that thrift shop picking in a neighbourhood like this is very different from the curated experience you get somewhere like Bloordale. 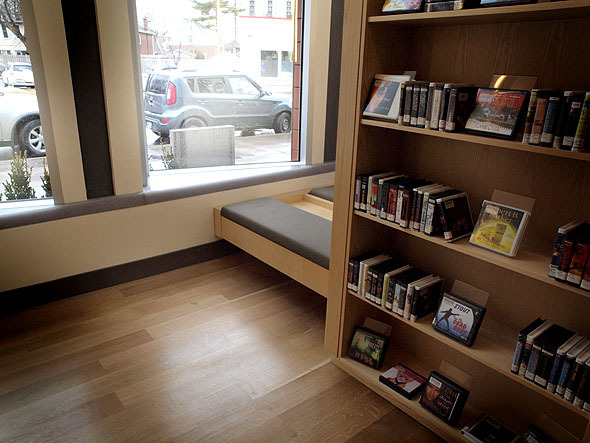 Make sure you make time to check out the new Mount Dennis library, opened last year after a major renovation and probably one of the greatest successes of the Toronto Public Library's series of high quality updates of their facilities. Take a seat on the bench by the big windows out front and look out at Weston Road and imagine when the street was full of shoppers and Kodak workers on their lunch break. 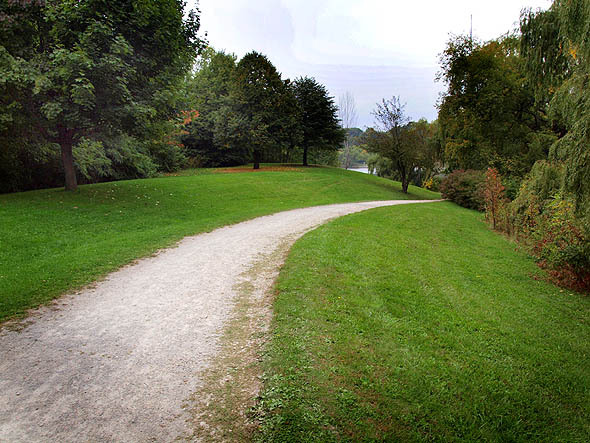 Right now, though, time spent in Mount Dennis will take you outdoors, best of all near Topham Pond in the northeast quadrant of the Eglinton Flats. Once market gardens, then a scrubby expanse of bush and grass around a raw hole dug out near a spring, it's grown with careful tending by the city and local volunteers into one of the city's loveliest parks, beautifully landscaped to an almost Olmstead-like series of picturesque views on paths wandering around the pond and its wildlife-filled wetland borders. You can use Topham Pond to launch yourself into a stroll around the streets between Weston and Jane, with their small but house-proud homes - make sure to try and spot the row of onetime rental cottages on Marshall Boulevard, a remnant of a day when Mount Dennis was the country, and a place where people went to escape the city. Or you can explore the green belt surrounding the area, following Black Creek past the under-construction community centre, along the concrete channel that contains it as it passes through parkland on its way to Smythe Park, named after Conn Smythe, once the owner of the Leafs and the former gravel pit he donated to the city, where his players used to train on the paths between the pits and the creek. Or you can follow the Eglinton Flats and their playing fields all the way to the banks of the Humber. That should build up an appetite. Back to Supercoffee for a caffeine and muffin recharge. Perhaps one day Mount Dennis will let you choose between competing charcuteries, but until then your best bet for dinner is Churrasqueira Beira Mar, just near where Weston Road crosses Black Creek. The chicken is great, and once again you'll be amazed to discover that someone is playing soccer nearly every hour of the day, somewhere in the world. There used to be two movie theatres in Mount Dennis and another one in Weston, but that was a long time ago, and right now you should keep an eye out for when UrbanArts, the local community arts centre, has one of their open air movie nights in the big parking lot outside their studio building. Apart from that, night life in Mount Dennis is either at the Legion Hall or contained inside the walls of the Irish Rose, the area's only pub. There are Irish and English beers, karaoke and locals who can get a little rowdy on the odd night, but I can guarantee that you'll have an evening here unlike any dozen you'll spend at Parts & Labour or Wrongbar. It's not generally a great idea to be found on Weston Road after the sun goes down, but if you're there with an appetite, head to 244 Pizza & Wings, a big favorite with locals who are happy to argue about what's best on the menu. Take care of yourself, though, and maybe you'll wake up the next morning, meet your friends for brunch and tell them about this great neighbourhood that could just use a Ravi Soups or a gallery or two. What did I miss? Add your suggestions for how to spend a day in Mount Dennis to the comments.